Awesome Lillian. Good to see you again. 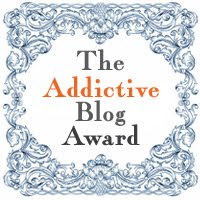 I will have to start following this blog. I love that recipe, and the added orange zest. The first time I made this, I called a lady from our church to get the recipe and she meant to say stem the grapes but told me to peel the grapes..let me tell you, I spent about 30 minutes trying to peel those grapes, gave up and called her back, we both got a lol out of that. First time seeing grapes served in such a lovely form, we always eat our grapes without any garnish here...got to try this too! I found this recipe just before Easter and I shared it with my mom in another state and we both made it for our guests on Easter day. It was a big hit! So yummy! Thanks for sharing a great recipe. My soon to be Son in Law makes a dish a lot like this but without the orange zest and with an addition of crumbled Butterfinger Candy Bars on top and it is delicious!! I make the same but i use brown sugar and small, small pieces of pecan mixed w/it. I then put it on top and it's wonderful !!!!!! I will try the orange zest though !! I'm loving the variations! Maybe I'll try it with crumbled Snickers candy bars so that I can have the chocolate, caramel and nuts mixed in! My mom makes this but uses almond extract instead of vanilla. When it is for a nice evening with the kids, i use a little bit of Dark chocolate in.. This sounds delicious and something to munch on on a hot day..... Thanks for the recipe. It looks delicious and lowfat maybe but not exactly "healthy". I guess that depends on the way you eat but will def try this over the summer thanks! When you say white sugar, do you mean confectionery or granulated? What is a "zest" of orange? I've made this for years, but instead of vanilla & orange zest, I just sprinkle brown sugar on top. It's delicious. Can't wait to try your version! would lemon flavor & lemon zest work as well? 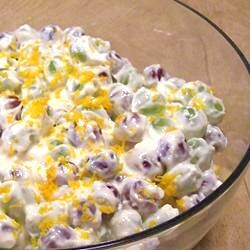 I make this often and it's called grape salad. About the only difference is mine doesn't use white sugar, it uses brown and not orange zest. I will try it with the changes next time. Everyone loves it and asks me to make it often. They are always surprised at how easy it is and love the taste. Thanks for the recipe! I made this last night for a party and it was delish, my kids loved it. To make it a little healthier I used greek yogurt and honey..yum! Love the orange zest! Will the topping freeze? I freeze grapes. I am assuming these are eaten with a fork or spoon if not frozen. I am in the process of making snow grapes at this time every thing out fo mixing. these recipes are great. what is your website?